Cailin O’Neil is a travel, video / filmmaker, snapchatter and food blogger from Halifax, Nova Scotia. Cailin started making films at a young age, graduating from the film program at the Nova Scotia College of Art and Design in 2007. When not focusing on her career in the industry as a freelancer, Cailin found herself traveling. Inspired by these two passions, Cailin is now a full time freelancer, blogging and making travel videos for TravelYourself.ca as well as being an active freelance travel writer and blogger on several other websites. Over the last 7 years Cailin has traveled to 47+ countries. She has snorkeled the Great Barrier Reef, cracked a whip on a homestead in Australia, tumbled down a hill in a Zorb in New Zealand, searched for the Loch Ness Monster in Scotland, rolled cigars in Cuba, tasted the many beers of Germany, eaten the varied pizzas of Italy, has gone on over 20 safaris in Southern Africa, has tasted Durian in Malaysia, trekked to see wild Mountain Gorillas in Rwanda, been chased by komodo dragons in Indonesia, and more and won’t be stopping anytime soon. If you are interested in partnering with Cailin, to create video content, instagrams, twitter campaigns, and other social media promotion or having her do a snapchat takeover or snapchat blogger promotion or having her visit your destination or property email cailinoneil (@) travelyourself.ca or use the contact form provided HERE. 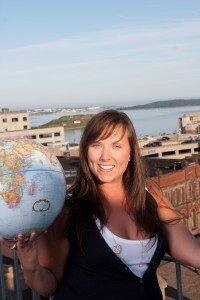 Cailin was proud member of Navigate Media Group and is a founding member of the Professional Travel Bloggers Association. Cailin has also been selected as one of the top 10 Travel Video Bloggers to follow in 2015 by FlipKey. Recent article on ThePlanetD.com How to Use Snapchat like a Superstar and Everyone’s on Snapchat!